While flipping through an old auction catalog I came across a painting of St. Mary Magdalene by an artist known to history only as The Master of the Parrot. That name was intriguing enough in itself, but there was something about the painting that was exquisitely beautiful and at the same time wonderfully strange. The saint in question, with a face as lovely as any painted by Bernardino Luini (was the Master of the Parrot one of his followers, perhaps? ), was seated before a decorative arch, clutching her usual urn in her unusually long arms. 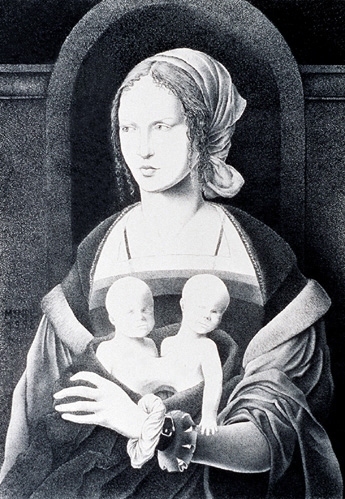 Something about that gesture and the elongation of her figure simply begged for a substitution, so now she holds conjoined twins.